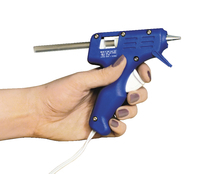 Surebonder Mini 380 High Temperature Trigger Fed Glue Gun features PTC heaters for lasting use and non-breakable handles for comfortable grip. light-weight glue gun has ball check nozzle to avoid dripping and is perfectly sized for smaller hands. Glue gun uses mini glue sticks having a dia of 5/16 inch.